I have read and heard some carvers say they look at a piece of wood and see what is there. I, on the other hand, look at a piece of wood and figure out how I can turn that piece of wood into what is my mind. My carvings start as a vision in my head. Some of those mental images develop as a result of my idea for something I want to create. Others come from a request or a special order from a customer. During the course of my conversations regarding special features and the design of a piece, a vision is created in my mind. It is only then that I can rev up my chainsaw and start the blocking out of an original piece of chainsaw art. My studio and home are located in Paradise, Nova Scotia. We are situated on the south side of the Annapolis Valley. Behind our home is a woodlot of approximately a hundred and fifty acres. Another hundred acres of fields and pastures extends north to the Annapolis River. This is my family home where my father and grandmother came to live in 1921. My wife, Paulette, and I have lived here for thirty years. We have two daughters, Lori and Cathy, who both live nearby and are also teachers. I have been carving for over a decade now and during that time have created over a hundred carvings. Wildlife carvings include six-foot high black bears, an eagle with a five foot wingspan, a golden eagle with a fish in its talons, a Bald eagle and an owl. I have also done carvings of fishermen, farmers, sailors, and various forms of Father Christmas. I also specialize in personality and character carvings. These carvings are made to order and represent real people with individual characteristics and features. One such carving was a retiring basketball coach in uniform, complete with knee-brace, numbered jersey and his favorite sneakers. Another was a special retirement gift for a local fire chief in full fire-fighting gear, complete with helmet and visor. I have also done a doctor with a syringe and thermometer along with glasses and a pencil behind his ear. One of my favourites is an historical New England Planter complete with tri-corn hat and traditional clothing. He now greets guests at the entranceway of the Cherry Hill Bed and Breakfast in Bridgetown. For all of these kinds of carvings I base my work on photographs and actual personal items that help make the carving “come to life”. Some of my carvings are modified so that they can incorporate a special add-on feature. One such carving was that of a sea captain holding a machine lathed brass telescope. He now stands proudly on a cottage deck overlooking the Bay of Fundy. Other characters have personal items such as eyeglasses, silver buttons, and a favourite tool or piece of jewellery. “Jack”, a local civil servant, wears a carved ring like the one his daughter gave him and holds a metal fabricated hoe that I made. My most challenging and unique carving project was an eight piece life-size Nativity scene. It included Mary, Joseph, two shepherds, three Wise Men, and Baby Jesus. 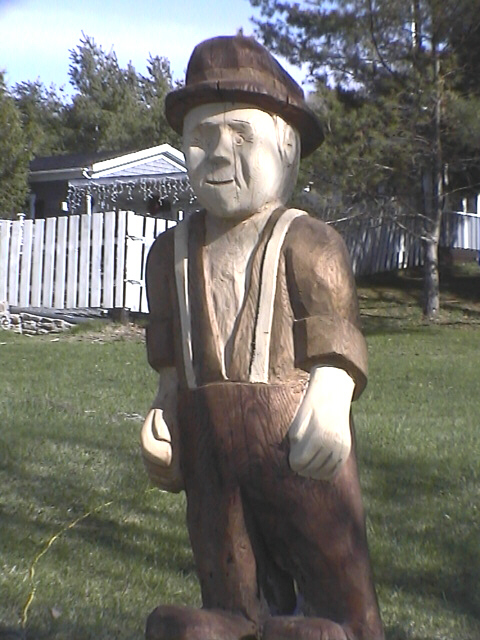 Carvings range in size from four to six feet high and are made from white pine. The wood comes from my own property and local woodlots. It is aged and dried naturally. All wood cracks as it dries, but precautions are taken to limit the cracking. Expansion cuts are put in where practical. Once the basic carving is complete, the more detailed work is done with a sander, a variety of chisels and a carving knife. The carved figure is then cleaned with high pressure air and treated to limit cracking. Although some figures are stained, most are painted with a base coat of exterior latex and then finished in various colours. Flesh tones are created with a natural stain and three to five coats of spar varnish. Although I have only been a wood carver for a relatively short time, I have worked in the woods and with wood all my life. My father was a hand-caver who was well known for his carvings of oxen teams. I grew up watching him block out small pieces of wood and changing them into the sought after carvings that people admired and praised him for. Miniatures yokes, tiny whips, ox carts, hay wagons, and drags added to the overall effect. Little did I ever think that I, too, would become a carver. Growing up in the Annapolis Valley on a farm with over a hundred acres of wood land on our property, I spent a great deal of my time in those woods. When I went off to college, I looked forward to coming home at winter and summer breaks to cut logs, haul them out and spend time on my own land and on the trails and in the forests nearby. My wife and I were married in 1970 and spent three years teaching in Halifax. It wasn’t too long before we returned to my childhood home in the valley. Once there I continued teaching but also continued to love working with a chainsaw on a variety of projects. In 1987 I completed a twenty-two by twenty-four foot log cabin completely constructed with a chainsaw, including cabinets and other internal features. At one point I was a salesperson for a small invention called a Beam Machine, a metal attachment for a chainsaw that allowed the operator to evenly saw off slabs of wood to square up the log. It was an instrumental tool for the building of the log cabin. My carving career began as a result of my wife’s collection of Santa Claus and Father Christmas items. She wanted me to make her a large size figure to add to her collection. It took me two years from the start to the finish of that Father Christmas but once done, my carving career seemed to have begun. That very first carving stands in the entry way to our back door and just inside the door, a pair of my father’s oxen welcomes me home. Although my wife’s request and my father’s inspiration got me started, chainsaw carving has become a fundamental part of my life. Since retiring from teaching, my time is my own, and a great deal of it is now involved with taking a log and watching it take shape as a carved figure or character. Although I have done two pieces of stump art, a small garden gnome and six foot tall train conductor who oversees a friend’s kilometre long track with a train with working engine, I prefer to work on pieces in my studio. However, I did work on a piece of stump art on my own front lawn. Like my first Father Christmas, this piece was two years in the making. It is the stump of an ash tree and takes the form of my father, John Whitman. He continues to stand looking northward over the fields and pastures of the home we both shared.